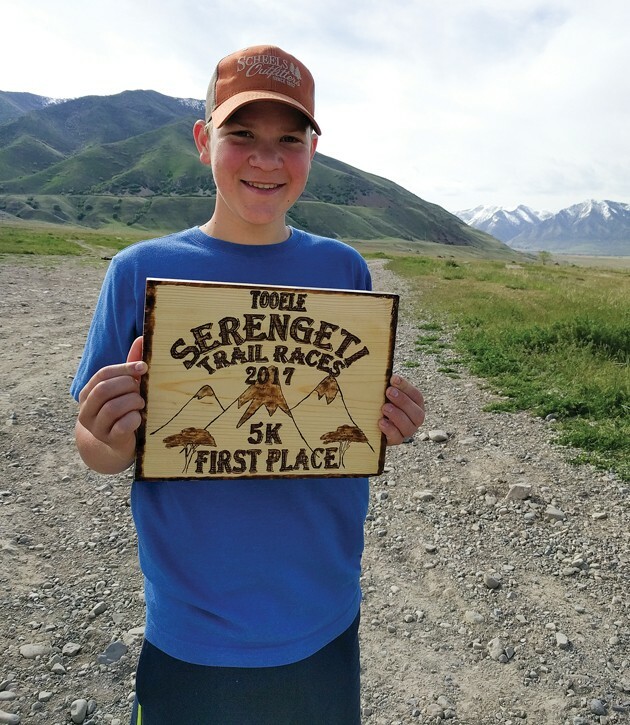 Xavier Jefferies, 14, holds the trophy he won as the overall winner at last year’s Serengeti Trail 5k. 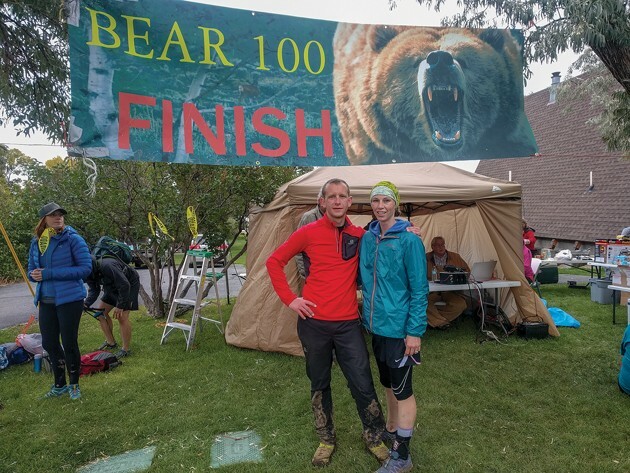 Jimmy and Kim Thomas stand at the finish line of the Bear 100 Mile Endurance Run. 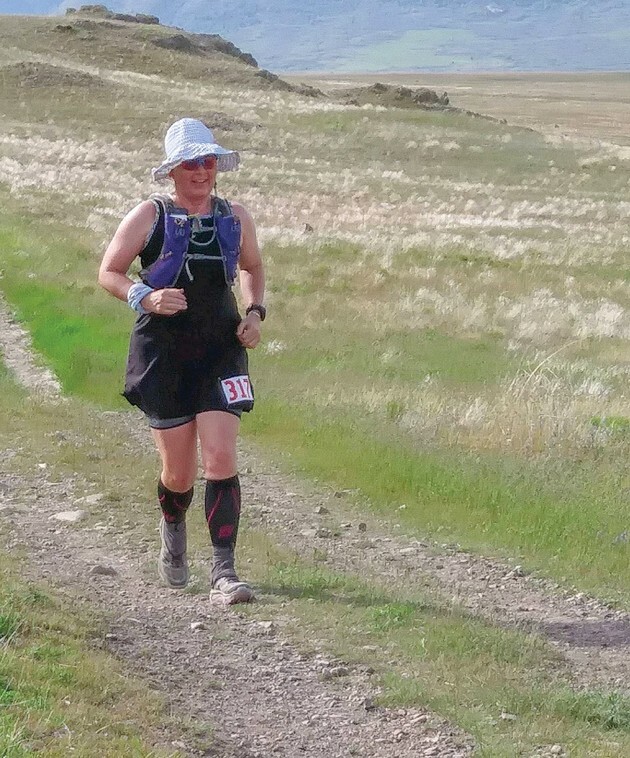 Kim Thomas paced her husband the last eight miles, from the Ranger Dip Aid Station to the finish in Fish Haven, Idaho. Rebecca Rich, 50, runs the course in last year’s Serengeti Trail Half Marathon. 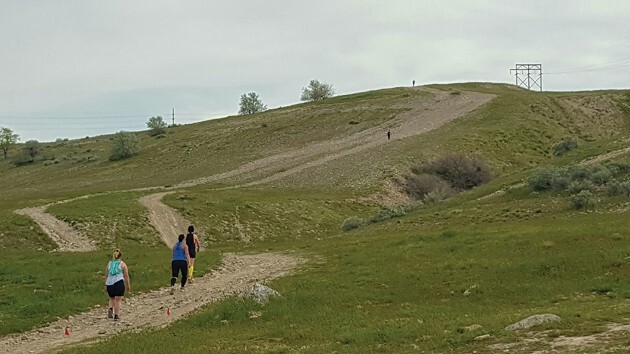 5k runners begin a big climb at last year’s Serengeti Trail Race. The race started at the Bates Canyon Trailhead. immy Thomas gives a pre-race speech before the inaugral Serengeti Trail Race. Ariel Palmer runs in last year’s Serengeti Trail 10k. She took third place overall in the race. Conrad Johansen and Seth Porter hit the course during last year’s Serengeti Trail Race half marathon. The race will be held again this year and registration has already begun. Jimmy Thomas hated to run until two-and-a-half years ago when his brother-in-law introduced him to mountain trails. His runs then began to soar to new heights as he trained for ultra races. For Thomas, 34, of Tooele, running on a road lined with houses didn’t interest him when he could just get in a car and drive the same path. 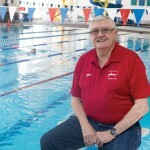 But in 2014, Pat Buhr, Thomas’ brother-in-law, piqued his interest in running. Buhr invited Thomas to run a Tough Mudder race — both a run and obstacle race that includes mud and just getting all-out dirty. After the race, Thomas, who works at Deseret Industries in Tooele as a job coach trainer, signed up for another obstacle course race — the Spartan. As he ran the race, he found the toughest part for him was the trail running, so he wanted to improve on this aspect of his runs. “I didn’t do well on the trail running and decided I needed to work on that,” Thomas said. So he continued up the trail-run learning curve. He discovered paths all over the Oquirrh Mountains and began running them, pushing himself even harder. “I’ve always loved hiking and backpacking and trail running is just that on steroids,” he said. In 2015, Thomas looked through his Facebook posts and found a friend who had posted about helping pace his brother for the Bear 100, an ultramarathon from Logan, Utah, to Fish Haven, Idaho. Thomas had heard of marathons before, but had no idea that 100 milers existed. Thomas further researched the Bear 100, and he decided that he wanted go for it. Unfortunately, when he went to sign up, he realized he hadn’t met the prerequisites for the run. First, he needed to finish a 50-miler and then he would work up to a marathon. After committing to the goal of running the Bear 100, Thomas’ initial long-distance training began. 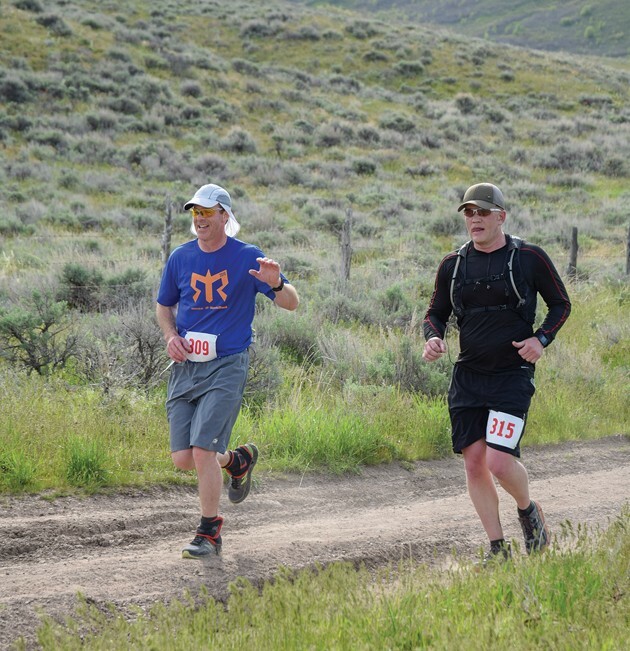 He signed up for and completed the Antelope Island 50k, the Salt Flats 50 and the Tushar 93k. The training and the longer runs inspired Thomas. He found trail running lent itself to quiet and reflection. While many runners listen to music, Thomas preferred the sounds of nature. By the time Sept. 29 came around, and after two-plus years of training, Thomas was ready for two full days of running. And, he would run his way — without tunes. 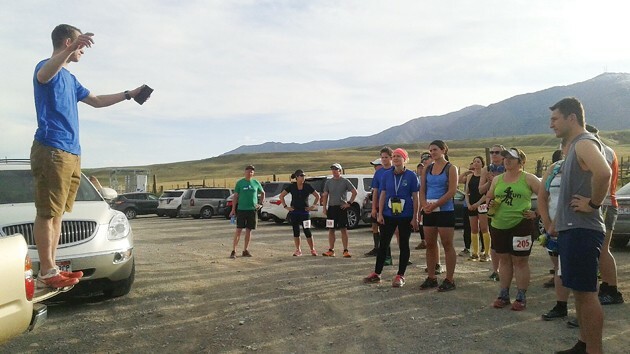 At the Bear 100, he toed the start line with 300 runners. Seventy would drop out before crossing the finish line. The race was grueling. During the run, Thomas had to overcome lack of sleep, sore feet and blisters. “Though I didn’t feel very good, great or wonderful, I was having the adventure of a lifetime,” he said. Thomas’s wife, Kim, and four of his five children, went to the race to support him. They were waiting to cheer him on at the last aid station, just eight miles from the finish line. 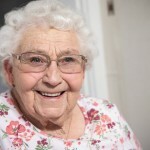 While scoping out the runners and waiting for her husband to arrive, Kim Thomas decided to volunteer, spurring runners on with both drinks and encouragement to finish the race. Kim Thomas ran with her husband during the last eight miles of the race. As they neared the finish line, she ran ahead to take pictures of her husband reaching his goal. Thomas said that as they ran the final eight miles, he calculated his pacing to finish in the allotted 36 hours. He crossed the line at 35:27:07, making the cut off time with more than 30 minutes to spare. He came in 209th place. His wife couldn’t have been more proud. 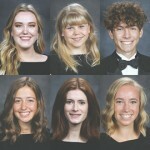 In the process, Thomas has also gained a buckle, plaque and a race shirt, but even more than that, he has garnered an immense sense of accomplishment. Thomas continues to set goals that push his limits. This year his goal is to run 1,500 miles and climb 350,000 feet, the equivalent of climbing Mt. Everest ten times over. With his work schedule, Thomas said he manages to get up by 5 a.m. for his run. Then, on Mondays, his day-off, he’ll run two or three hours. In addition to pushing his running boundaries, Thomas feels strongly about helping other local runners to push their limits as they break into trail running. 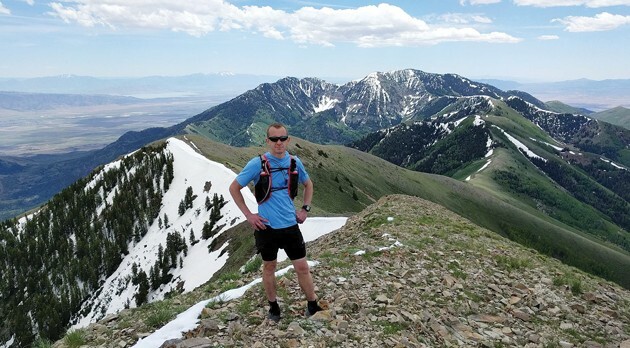 Last year he organized the Serengeti Trail Race on the Oquirrh Mountain’s Serengeti Trail. There were 44 racers between the trail’s three distance runs — the 5k, 10k and half marathon. “I thought it would be appealing to beginners or people who wanted to switch from running roads to trails,” he said. This year the event will be held on April 28. Thomas runs the course beforehand, to set a record time for participants to beat. Last year, two contestants beat his time on the half marathon course. Thomas shares his love for running with others through his posts on social media and the Serengeti Trail race he started. 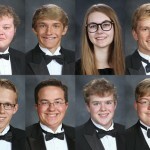 Thomas wrote about his Bear 100 experience and has posted it on his Facebook page for others to read. He believes that local runners’ enthusiasm for the county’s trails will only build as he continues to share his love for trail running with the community. 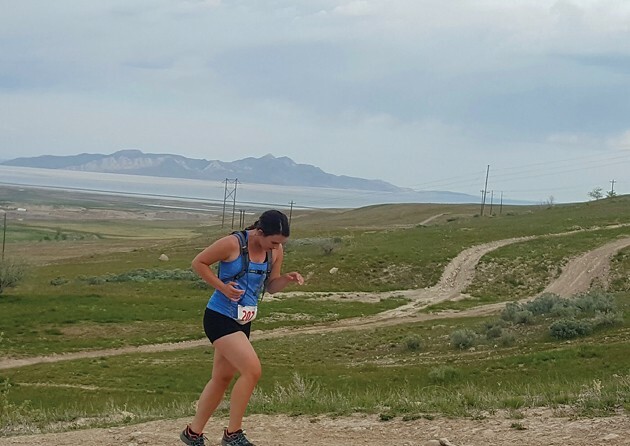 To find out more about trails in the Oquirrh Mountains, see pictures of last year’s run, or to sign up for the April Serengeti Trail Run, visit oquirrhtostansburytrailseries.com.